2019 is just a few days away. People are looking forward to a new year. They will be making those infamous new year’s resolutions. Whether they hold to those resolutions doesn’t matter right now. Right now it’s just the thought of a new beginning, a fresh start, that encourages them. As a pastor, you can also be an encourager through the Word of God. This unique period makes the start of the new year a great time to focus them on a particular topic at your church through a sermon series. Here are 3 sermon series ideas you can use to take advantage of your people’s optimism for 2019. I believe every member of the church should be involved in evangelism. Reaching out to our community must be a pillar of our church if we’re to fulfill Jesus’ calling. I also strongly believe that church evangelism has to be more than another program we have. The picture the Bible paints of reaching the lost in our community with the Gospel is not a program. It’s a lifestyle. Our church members shouldn’t think that evangelism is only for those who are paid staff or the super-spiritual. Sharing the Gospel is the calling, privilege, and duty of every single Christian. The point of this sermon is taking the first step in reaching people – praying. The Scripture used is Luke 10:1-2. Jesus says to pray for the harvesters, the laborers, not the lost. That’s the church. Before the sermon, I set up a big whiteboard in front of the stage. I put out some pens and post-it notes. The invitation focused on people who wanted to reach their community. If they had that desire, come up, write your name on a post-it note, and stick it on the whiteboard. I would pray for them, our small groups would pray for them, and others would pray for them to have the courage to boldly carry Jesus into their spheres of influence. Prepare yourselves for reaching the community. Our calling is not just a one-shot deal but a lifelong calling. Prepare yourself for commitment. The whiteboard was still in front of the stage. People were invited to put their names on the board if they had not the previous weekend. Then all of us, as a church gathered at the whiteboard and prayed for those who had placed their names there. Where are your places? Where do you work, live, socialize? Those are your spheres of influence. Before Sunday, I moved all the names posted on the whiteboard to a wall where they were still prominent. So the whiteboard was empty. During the invitation, I invited people to come write down their places, their spheres of influence, and place them on the board. Then we prayed for those places and during the week our groups and church members praying for those specific places. Who are the people in your sphere of influence who need Jesus? Again I cleared the board and invited the church to place specific names of people within their places who needed Jesus. And again, we prayed for them, that morning and throughout the week. The emphasis was on three different groups of people we all know. And that Jesus wanted to redeem every last one of them. Don’t bypass people because of who or what they are. They all need Jesus. The three groups from the prior week were examined from the viewpoint of Jesus. How did Jesus interact with these groups? What was His message to them? Jesus is our example in everything, especially evangelism. We should emulate Jesus. Sermon 7 – You were created for this! We looked at Jeremiah and saw how he was created to do what the Lord called him to do. So are we. We were created to make a difference, to be used by God to change people’s eternities. This sermon series is formed around the idea of making a fresh start, a new step toward God. 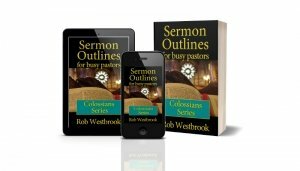 My book Sermon Outlines for Busy Pastors: Fresh Sermon Series, comes from a time when my church had been through some tough times. There had been deaths, of both the old and young. Some people were struggling financially. We had lost some people from the church. Our people needed some encouragement, to hear the voice of God, through the Bible. The one essential thing for a fresh start (Jesus). We need a fresh view of worship. We need a fresh view of the Bible. We need some fresh courage. We need to refresh our mission. We need a fresh perspective. We need a fresh view of the church. We need a fresh grasp of the Gospel. So many times, when things get rough and overwhelming, many Christians bail out. There’s nothing inside that holds them to their faith and they fold. Christians need to be well rooted in the faith. When we’re well rooted, even if everything is stripped away, we still have solid roots by our faith in Jesus. As a student of theology, I loved preaching this series. I loved taking the Bible and teaching what it had to say about the foundational pillars of our faith. The people’s reaction was amazing. They really soaked it up. This series firmed up the foundation of our people and the church as a whole. Sermon 2 – What is God like? Sermon 13 – What will happens when Jesus returns? Maybe these three ideas will get your gears turning about what you can preach beginning the new year. And these sermons will preach at any time during the year, as well. If you’re beginning the new year with a sermon series, tell me about it in the comments. I’d also like to hear the subjects of any sermon you’re using to start the new year.